In the autumn of 1979 a party of Senior Citizens from Rosslare visited Fethard-on-Sea and admired the beautiful monument in the village to the Fethard Lifeboat crew, so lovingly preserved by our great friend Mr. John Doyle N.T., historian and author, and his dedicated pupils. A few of us felt what a shame it was that Rosslare had never done anything to commemorate it's Lifeboat Heroes, involved in the same service at the wreck of the MEXICO where nine members of the Fethard crew were drowned and where the Rosslare crew performed great deeds on heroism. It was decided to erect some token of remembrance and straight away a small committee was formed to raise funds. When the good people of Rosslare Harbour and Wexford heard of our proposal they said they would like to give us every assistance. It was decided that the memorial should also commemorate Capt. Busher and the crew of the Wexford Tug, which played such an outstanding role in the same rescue. Therefore, on the anniversary date 19th February 1981, a huge meeting assembled at the Golf Hotel, Rosslare. It was attended by lifeboatmen past and present, relatives of the lifeboat crew, seafaring men from all over the Southeast, several business people and people from the district. Many letters of support were received and one of special interest came from Mr. Joseph O'Brien, Kilmuckridge, nephew of crewman John Mitten, offering help and full support. Several prominent people spoke in favour of the project and suggested various ways of raising the necessary funds. Mr. Raymond Wickham (Jnr) the the Irish Lighthouse Service offered to make a scale model of the brigantine 'Asgard 11' to raise funds. The offer was gratefully accepted. As there was a massive response to the appeal for funds from the very outset and a huge sale of tickets for the Asgard model, it was found possible to order a very fine limestone column by Wexford sculptor J. Nolan and a lifeboatman's head in bronze by the County Kilkenny sculptor Pat Dolan. The bronze head was modeled on the well-known face of Fergus Wickham. A fine site was generously donated by Messrs. Patrick & Nicholas Furlong, Iona Hotel. 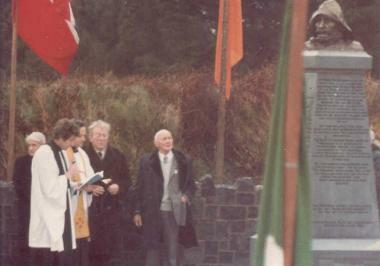 Christmas week 1981 saw the culmination of effort, when the memorial was erected, commemorating those who gave so much, in the centre of the Little Strand, Burrow where most of them were born, lived and died. Sometimes failure, very often success but every now and then, inevitably when one remembers the conditions in which the lifeboat service does it's work, sudden disaster. Nine life boatmen from Fethard died, but those for whom they had given their lives were in the end, saved. 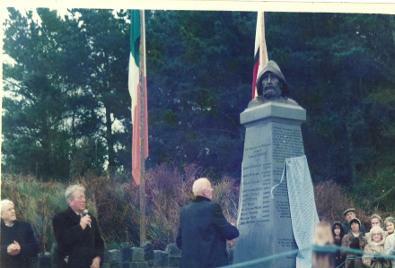 Since the unveiling of the monument in 1982 by Edward Wickham, many relatives, local historians, local dignitaries and interested parties have been invited to lay the wreath at the annual ceremony held in February of each year to mark the anniversary. 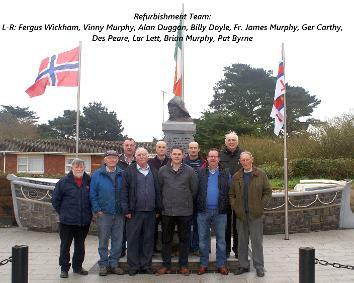 Determined that the sacrifice and bravery of the lifeboatmen should not be forgotten by the passing of time, Rosslare Lifeboat Memorial Committee under it's Chairperson Billy Doyle and Secretary Dessie Peare organised a full programme of events to mark the Centenary of the tragedy and the subsequent rescue. 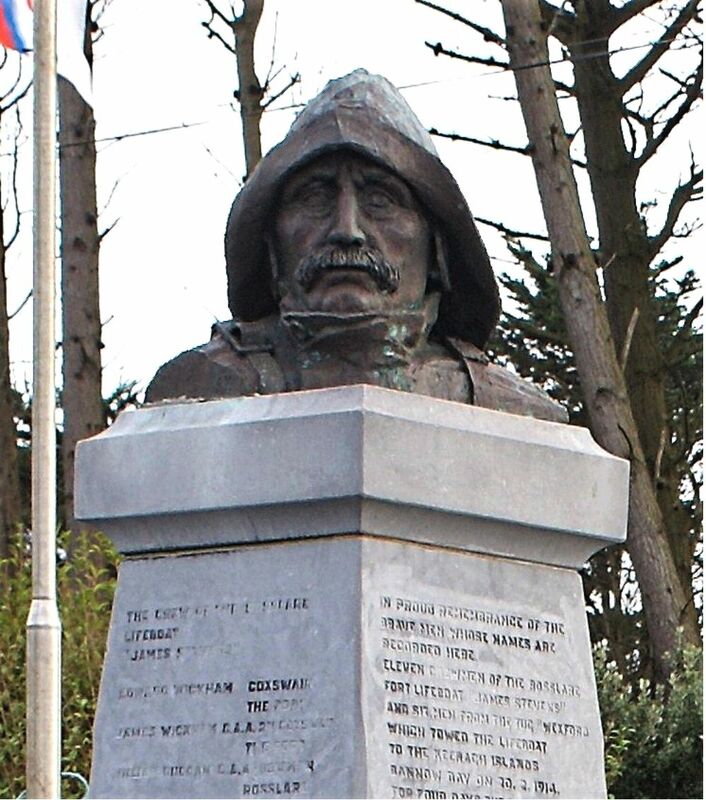 The main event of the Commemoration was the wreath laying at the Burrow Lifeboat memorial on Sunday February 23rd. Fr. James Murphy blessed the principal wreath at morning mass in St. Bigids Church, Rosslare. The event started at the monument with the Holy Family Confraternity Bank from Wexford playing some appropriate hymns, followed by firing of flares and the moving rendition of 'Home From The Sea' by the RNLI crews under the able direction of Ron O'Rourke. Brian Murphy who acted as Master of Ceremonies for the day, delivered a message of goodwill from President Michael D. Higgins. Attendees travelled from far and near to participate in the anniversary celebrations. 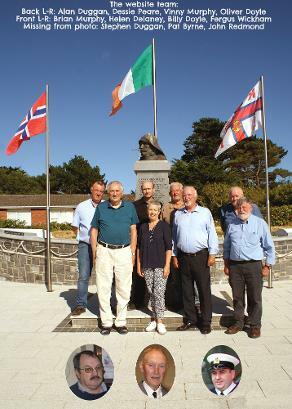 A party of nine Norwegian visitors attended the monument on Friday morning 22nd accompanied by Declan Hearne of Fethard. This group included two grandchildren and other relatives descended from the captain of the Mexico Ole Eriksen. The wreath laying was preceded by a parade from Rosslare Burrow Golf course to the monument led by New Zealand piper Hamish Stuart. Marching in the parade were members of the RNLI, Coast Guards, GAA, Rosslare school children, local and foreign public representatives and many friends and supporters. The principle wreath was laid by Norwegian Ambassador Roald Naess. Relatives and family members laid personal wreaths. The great-grandson of one of the heroes Jim Wickham produced a commemorative video entitled 'Go You Must' which was dedicated to the late historian Ibar Murphy. The video which was shown at Kellys Hotel, Rosslare, contained some historic archive footage recorded in 1983 of Rosslare Fort Resident Raymond Wickham Senior, local historian Ibar Murphy, RNLI World Concorde rescuer Jack Duggan and the then curate at St. Brigids Church Fr. Brendan Nolan. The audience found the poem 'Keeragh Rock Rescue 1914' (see left) by Rosslare poet Gaye Wickham Murphy particularly moving. Video footage of the Keeragh Rocks, Rosslare Burrow and the Hook peninsula taken by William Murphy provided a dramatic backdrop for the informative interviews. 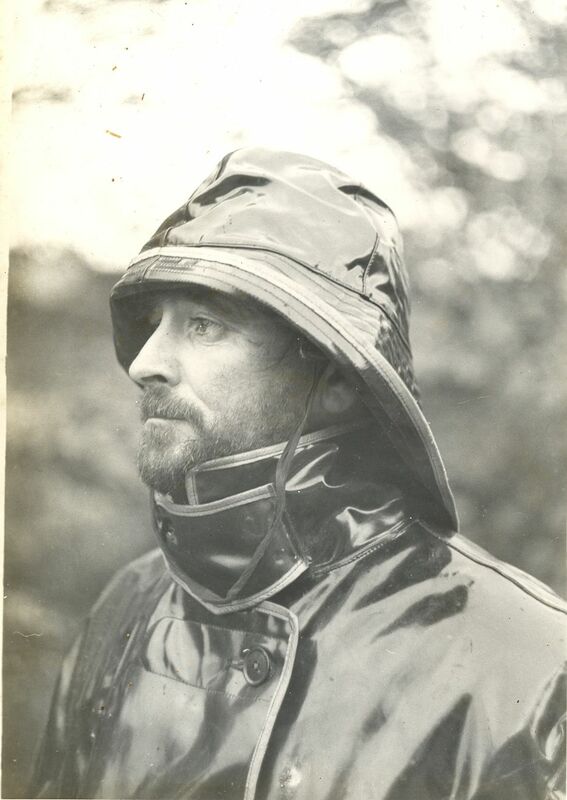 This was complimented by many interesting still shots of yesteryear from local photographer Oliver Doyle. It also contained visual additions by maritime artists Brian Cleare and Kenneth King. The music track 'Heroes of the Helen Blake' on the video was by kind permission of Kilmore composer Liam Bates. After the 2016 wreath laying ceremony, the committee felt that the monument needed some upgrading. Some minor work needed to be done i.e. removing the tarmac and boulders and replacing with new bollards. Cllr. Ger Carthy was approached for advice regarding funding and following several meetings, Cllr. Carthy confirmed that Wexford County Council would support a complete refurbishment of the area, including a new granite area and new brick work as well as wheelchair access and new bollards. The committee would then look after refurbishment of the back drop - a new scale model of the James Stevens No. 15 Lifeboat in stone. 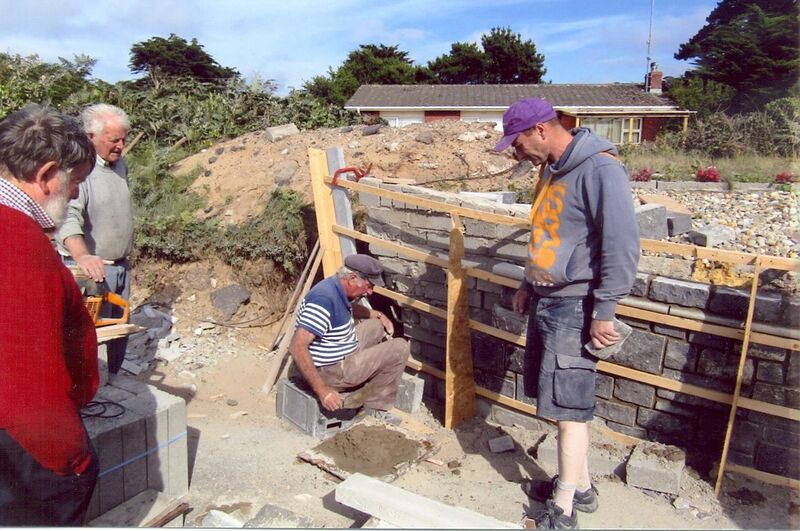 Work commenced under the watchful eye of Billy Doyle. Billy undertook the building of the scale model and with great support from everyone, the job was completed to a very high standard. As well as Billy Doyle and the committee members, many other people were involved in the project : Finney Murphy, Colm Murphy, Noel Peare, Liam Boggan, Sean Gorman, Laurence Lett, Wexford County Council workers, Larry Duggan, Stephen Duggan, Fr. James Murphy, Rosslare Golf Club Committee, Rosslare Small Boats Committee, Widgeon's Rest Fish & Tackle Shop Burrow, Liam Byrne, Don O'Donoghue, Martin Nolan of Nolan Stone and Michael and Terry Hayes stonemasons. We have made every effort to report all information as accurately as possible.If you wish to contact us with further information or news, we would be delighted to hear from you. Please use the contact form below and we will respond to you as soon as possible.